Perfect for a media or home theater room, this group of seating is comfortable and features convenient storage. With built-in cup holders you can have your beverage stored right next to you without worrying about spills. The console storage area is perfect for small remotes, cords and other items you want within reach. Kick back and extend the footrest to be comfortable from head to toe. The Banff II Contemporary Sectional Theater Seating by Palliser at Turk Furniture in the Joliet, La Salle, Kankakee, Plainfield, Bourbonnais, Ottawa, Danville, Bradley, Shorewood area. Product availability may vary. Contact us for the most current availability on this product. 42210-47 Left Hand Facing Recliner 1 28" 37" 40"
42210-W2 Console 2 13" 30" 24"
42210-46 Right Hand Facing Recliner 1 2837" 40"
42210-30 Armless Recliner 1 23" 37" 40"
Warranty Ten year warranty on wood frames, springs or webbing. Two year warranty on metal frames under normal household use. Seven year warranty on motion reclining mechanisms. 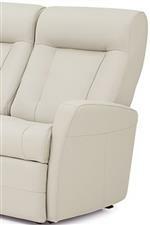 Two year warranty on reclining chairs, sofabed mechanisms and sofabed mattresses. Five year prorated warranty on seat cushion foam and fibre-filled components. The Banff II collection is a great option if you are looking for Contemporary furniture in the Joliet, La Salle, Kankakee, Plainfield, Bourbonnais, Ottawa, Danville, Bradley, Shorewood area. Browse other items in the Banff II collection from Turk Furniture in the Joliet, La Salle, Kankakee, Plainfield, Bourbonnais, Ottawa, Danville, Bradley, Shorewood area.